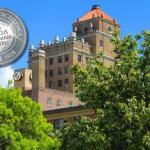 With a historic facade plush rooms and extras like free internet access the Marcus Whitman Hotel and Conference Center is one of the city's most popular hotels among our guests.The 12-story building erected in 1928 is one of Walla Walla's most beloved landmarks and it cuts a dashing profile. The 91 non-smoking rooms have luxurious furnishings including extra-thick beds dressed with down pillows and comforters along with modern amenities like flat-panel TVs iPod docks and free Wi-Fi mini-fridges and coffeemakers. There's a well-stocked fitness room and two elegant restaurants including one with outdoor dining in the summer. Pet-friendly rooms are available and parking is free. From Marcus Whitman Hotel downtown destinations like the Kirkman House Museum are within walking distance. Whitman College is less than a mile away and Walla Walla University is three miles away. Walla Walla Regional Airport is four miles east.